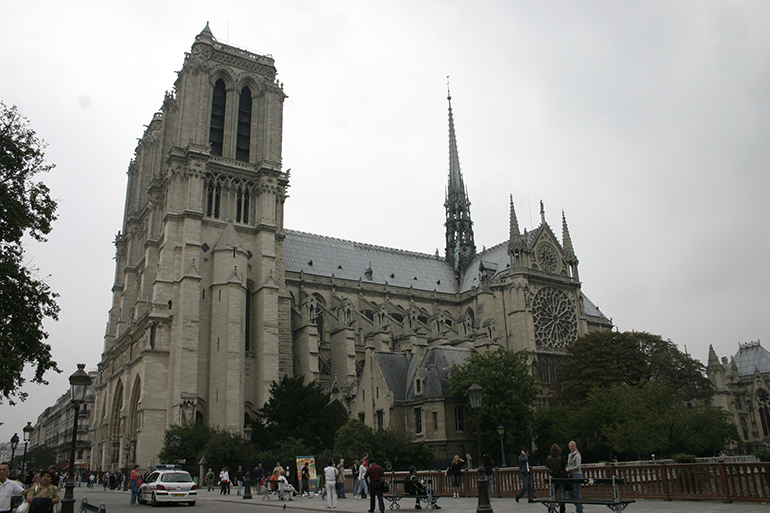 File photo of Notre Dame Cathedral in 2006. MIAMI | As firefighters struggled to contain a massive fire at Notre Dame Cathedral, both the Vatican and the U.S. bishops issued statements assuring the people of Paris and all of France, especially those fighting the fire, of their prayers and support. According to Catholic News Agency, Archbishop Michel Aupetit of Paris said that "firefighters are still fighting to save the towers of Notre-Dame de Paris. The frame, the roof and the boom are consumed." "Pray," the archbishop told the priests of Paris. He also invited them to ring church bells as a public invitation to prayer. Local media are now describing the fire as contained within the cathedral building. Firefighters have cautioned that although the height of the flames appears to have abated, the fire within the cathedral itself is not under control. Efforts were initially hampered by the height of the cathedral roof, which prevented emergency services from reaching the flames. No announcement has yet been made concerning any injuries or fatalities resulting from the fire. Officials also have not yet determined what caused the fire, which is still burning. Both the fire department and the office of the public prosecutor in Paris have confirmed that investigations into the origin and cause of the fire have been opened.